Eagles cornerback Sidney Jones during the Titans game on Sept. 30. 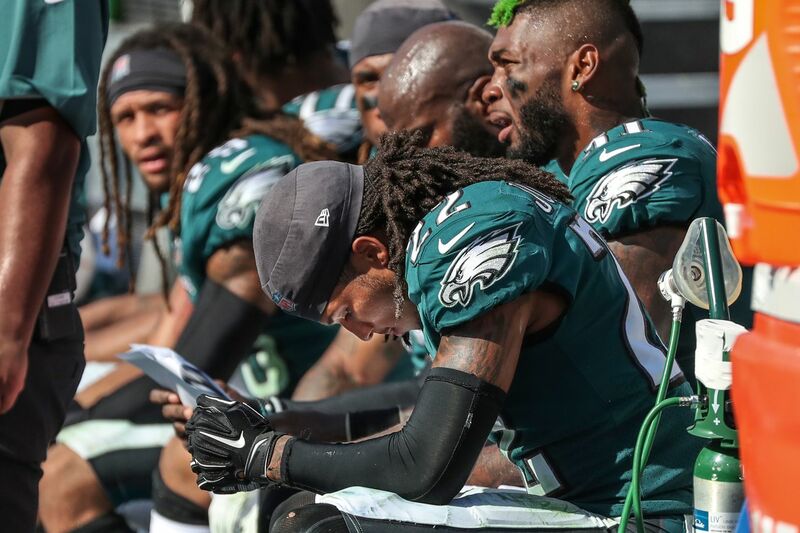 EAST RUTHERFORD, N.J.— Sidney Jones injured his hamstring in the second quarter of the Eagles-Giants game Thursday night and was quickly declared out, leaving the Eagles without their slot cornerback and forcing the Eagles to adjust their secondary. Jones's injury occurred on special teams while he was playing on the punt-return unit. After Jones' exit, the Eagles used Avonte Maddox as the slot cornerback in the nickel formation and played Rasul Douglas at safety. It was the time first Douglas played safety since joining the Eagles last season. Maddox, who is now the Eagles' starting safety, remained the safety in the base defense. The Eagles used Douglas over safeties Deiondre' Hall and Tre Sullivan. Jones, who missed 15 games last year while recovering from a torn Achilles tendon, had an ankle injury earlier this week. He has not missed a game this season. The Eagles will have extended rest before next week's game against the Carolina Panthers, but Jones' injury will be important to monitor. He played 66 percent of the defensive snaps in the first five games. The Eagles' trip to North Jersey was enlivened by the news early Thursday morning that right tackle Lane Johnson was being designated as "questionable" with a high-ankle sprain. It's unclear when the injury occurred, but Johnson gave up a strip-sack for a touchdown in the loss Sunday to the Vikings. As soon as the tarp was off MetLife Stadium's field Thursday, Johnson was out there in the gloomy drizzle, testing himself with the help of a trainer. He was active and started as usual, but in the early going, both Johnson and ailing left tackle Jason Peters gave up pressure to an aggressive Giants defense. The Eagles took a 14-3 first-quarter lead anyway, and both tackles seemed to settle down. Johnson has been suspended twice for a total of 14 games, but he has missed only one other game in his six-year Eagles career, last Oct. 12 at Carolina, when he was sidelined by a concussion. With Johnson in the lineup, the Eagles' inactives were linebackers D.J. Alexander and Nate Gerry; safety Corey Graham; offensive lineman Jordan Mailata and Matt Pryor; and running back Darren Sproles. Mailata and Pryor were the only healthy scratches. The other five were declared out Wednesday. Alexander has a quadriceps injury, Gerry has ankle and knee injuries; Graham has a hamstring injury; Ngata has a calf injury; and Sproles has a hamstring injury. Nate Sudfeld was active as the third quarterback. Chance Warmack was active as a ninth offensive lineman because the Eagles have so many players out with injuries. Safety Tre Sullivan played one day after getting promoted from the practice squad.